Forgive the late wish for a happy Founder’s Day. In the Believers’ Church, K.P. Yohannan’s birthday is considered a special day and singled out for celebration. This is the Birthday of our Metropolitan. On this day, the Church shall organize compassion ministries such as providing food for the poor and beggars, social work, gift distribution to the poor and downtrodden, etc. These activities fulfill the dream of our Metropolitan to love others as Jesus loved us. Remember the controversy over ring kissing in the Believers’ Church? One of the original complaints of former GFA staffers related to the undue reverence given to Yohannan as illustrated by the custom of kissing Yohannan’s ring. Yohannan not only denied that it was a part of his experience in India, he said he never saw it happen. 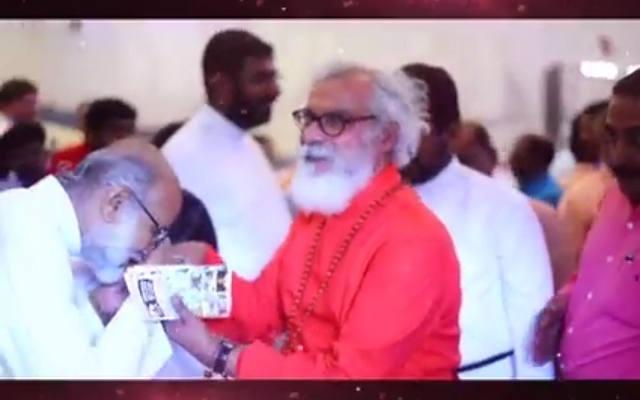 Then video surfaced of newly initiated pastors kissing Yohannan’s ring. Now in this video, we can see that at least some of his admirers continue to practice ring kissing (or at least hand kissing). For GFA supporters who claim Believers’ Church is evangelical like Calvary Chapels here in the United States, videos like this must be hard to integrate into their GFA narrative. In any case, donors need to understand that when they give to GFA, they are supporting this field partner in India.